Nose: Tarry peat smoke. Dried beef slices. Honey. Peppery. Noticeable alcohol. Sulphur. Charred oak. Cigarette ash. Water adds more smoke, salty rocks and caramel. Slightly floral. Body: Smooth – caramel and custard. Alcohol if held. Tarry. Dried beef slices. Red cherries. Water makes more caramel and more tarry notes. No alcohol evident now. Peppery. Even more water increases the caramel. Finish: Bready. Peaty. Some moss. Malt chocolate. Red cherries. Dry. Water adds salt, charring and mild chocolate cake. Fudge. Peppery. Conclusion: Quick summary – with no water, meh this is ok. With water – oh yeah, this is what I am looking for. Either way, the aroma tells you exactly what is coming. The aroma is tarry, peaty and evident from way across from the glass. I could pickup the first notes while still doing the photo shots at the start. Lots of thick notes here, but without the harsh or medicinal notes that an Islay would have in a similar whisky. Neat it is fairly smooth – if held too long alcohol does develop, but generally nothing too heavy. However when neat the flavours doesn’t hold half the weight that the aroma promises – it is generally more dominated by the smoother caramel notes. There is some rounding – some dried beef slices and interesting cherry notes, but really lacking the tarry thickness of the aroma. As I have been indicating at the start, water really does the job here. The alcohol is all smoothed away – a slight island salty and rocky character gets added to the smooth caramel base. More importantly the bigger notes promised come out – peppery, thick, tarry. It is still smooth bodied but now with a weight of flavour which then leads out into a chocolate and fudge finish that is matched by peat and salt. It feels like it takes all the benefits of a harsh Islay, strips the harshness and adds it to the traditional island Talisker complexity. Another stormer (ha-ha) of a whisky from Talisker. Background: The final of a pack of three Talisker miniatures grabbed from Independent Spirit. This one is described as a more intense flavours take on the standard Talisker. Which sounds good by me. I was a bit nervous as I know either Storm, or Dark Storm has a really bad reputation. But, since I couldn’t remember which I tried to not let that influence me. This was drunk while listening to Ulver: The Assassination of Julius Caesar again. Still getting used to the very different nature of it, but good background drinking music. Viscosity: Mix of slow and fast medium sized streaks. Nose: Salt. Wet rocks. Smoke. Seaweed and rich caramelised brown sugar. Crumpets. Black liquorice. Water makes slight golden syrup backing and treacle. Body: Smooth. Vanilla and soft lime. Rocks. Some alcohol character. Brown sugar. Light peaty and meaty character. Slight vanilla custard. Water makes buttery and smooth. Apricot. White chocolate. Finish: Brown sugar. Crumpets. Slight chalk. Slight charring. White bread. Cooked pork. Vanilla custard. Water makes buttery with a mix of white chocolate and golden syrup. Tinned tropical fruits and toasted teacakes. Conclusion: For all this does have an alcohol touch to it, this is a very smooth whisky – one that progresses from gentle sweet elements to entice you in, into the more recognisable, robust Talisker character. It holds the gentle peat warmth, the slight salt and the gentle not-Islay island coastal character of a standard Talisker, and rides out into vanilla custard and brown sugar as the sweet base develops. This is not too unexpected – while this is less forceful than the 10 year old, it still plays in a familiar ball park. What stands out here is the gentle bready character to the whole thing – from crusty white bread to crumpets – all touched with buttery sweetness – it gives both a gentle grip and an extra smoothness in the combination. The butteryness especially feels thick – slightly oily – full natural butter feeling with the flavour rather than cheap supermarket stuff. Water soothes the alcohol touches it had when neat, and brings out some sweet aprictots, but the general gist of the thing remains the same. Overall a very impressive dram that captures both the expressive island character. And a slightly more gentle sipping whisky, balanced by toasted teacake top and bottom. A gentle yet complex and toasted dram. Very nice, very easily drinkable – very much up my street. Background: So, after the uber whisky night I felt like more whisky a day or so later. So, I remembered I had a pack of miniature Taliskers I had grabbed from Independent Spirit a few weeks before. Time to break them out. This one is aged in a mix of refill and toasted American oak casks – apparently to give a bit smoother character. This was drunk while listening to some of the haunting Ulver tunes on the atgclvlsscap album. Very good background, yet atmospheric music for a good whisky. Viscosity: Moderate speed and thickness streaks. Nose: Dry rum and brandy cream. Slight smoke. Moss. Thick aroma. Light oak. Butter. Water adds some blueberries. Body: Toffee. Light caramel. Light treacle. Strawberry. Alcohol is noticeable. Buttered crumpets. Water brings out sweet butter. More strawberry. Fudge. Vanilla and brambles. Finish: Alcohol air. Toast. Light charring. Red berries. Toasted teacakes. Butter. Smoke. Water brings more butter and red berries. Blueberry. Conclusion: This is very bready indeed – like a mix of toast to toasted teacakes. Really solid, and packed through with red fruit. It is very interesting examining this one immediately after the Springbank 25 year – they both wear their port influence proudly. This is more solid, and because of that is more immediately appreciable as a whisky. However because of that it also doesn’t wear quite the same range of flavour at the tail end of its life. By the way that isn’t intended as a harsh criticism – more an examination of the trade off you get with whisky. It is very nice, with subtle vanilla sweetness matched with lightly tart red and dark berries. It is a full on, rich berry expression – very much pushing the imagery of picking your own berries on a summer picnic kind of thing – the Highland Park base giving a solid texture and weight for the fruity experience to work from. It feels full of brambles – and if this was just slightly jammy it would make a perfect image of full on jam covered toasted sandwiches. It isn’t so it doesn’t, but it is that kind of thing it is coming close to. As it is it is a fresher faced experience, with a solid whisky base. Without water it feels a bit more thick and musky – with water the freshness of the fruit opens up. So, Springbank 25 wins on complexity – but you cannot go far wrong with this for a solid experience. Again, maybe not worth the cost of a fancy bottle, but very much worth trying if you can. Background: Yep, it is the fourth of the whiskies tried at the recent Independent Spirit Uber Whisky Tasting. This one, well I am a big Highland Park fan, but I can’t quite shake the impression that you are paying a lot for the bottle on this one. It is a pretty bottle I will admit. Not several hundred quid pretty, but pretty. Anyway, this is one of 28,000 bottles and is aged completely in port casks. Anyway, as always for these events – I was doing my notes in a social environment, with five strong whiskies back to back – my notes may be affected by other peoples thoughts, the drunkenness, and the other whisky I had. However, as before, for trying five expensive and rare whiskies like this I could hardly miss the chance to do some notes. Hope they are ok by you. Viscosity: Quite slow thick streaks. Nose: Treacle toffee. Cinnamon. Honey. Cinnamon rolls. Light tar notes. Thick. Sugared orange. Stewed fruit. Water adds cinnamon pears. Body: Strong. Alcohol presence. Orange liqueur. Spiced rum. Treacle toffee. Cinnamon. Water makes cinnamon pears. Slight charring. More water adds apples, a touch of salt. Vanilla toffee and treacle. Finish: Malt chocolate and light oak. Spiced wine notes. Cinnamon and pepper. Light charring. Water adds treacle and chocolate liqueur. Light salted rocks. Conclusion: Jura have been a go to whisky for me for a while now. Their entry level stuff is very nice, and generally not too expensive – while their Prophecy expression stands out as a great, complex peaty whisky. This is different again from those. The higher abv gives it a bigger, thicker character and a lot of room to roam. This is a dark, rich expression with deep chocolate liqueur notes and light charring – all darker notes which calls to Bowmore Darkest or some of the Dalmore series for inspiration. It has that similar, very luxurious character, albeit with a strong alcohol punch if taken neat, and they are accentuated by a definite cinnamon sweetness and rum to red wine spiciness. It really, even when with the force of being neat, gives a decadent dark dessert feel. Death by chocolate meets cinnamon doughnuts. Water soothes out the alcohol weight and gives hints of lighter notes hidden below it; Never huge, but there are feelings of subtle cinnamon pears and such like in there. Also water brings out, on the opposite side, subtle more traditional island characteristics – light salted rocks – again very minor, but gives it a grounding so it is not just a sweet, thick whisky. Overall these just balance out an already very good experience – it gives hints of the more familiar expressions of Jura, but matched with that luxurious chocolate and cinnamon – making it like an island character backed dessert expression. Just enough added edge to make it unusual. Very nice indeed, and probably now my tied favourite Jura with Prophecy. Background: The 14 year is from a quick google that says the youngest spirit in this is 14 years. Anyway – this was my first tasting note done at The Hideout – a new whisky bar in Bath. Damn they have a nice selection – will try and take advantage of them to get some more unusual whisky tasting notes up on here. It is always nice to be able to try the more unusual stuff by the dram. This one is the Jura whisky done for the 2016 festival and has been aged in Palomino Fino, Amoroso and Apostoles sherry casks. Which actually goes beyond my knowledge of Sherry, so I will assume that is good. Visual: Quite light grain to gold. Viscosity: Generally slow thin puckering, with a few fast streaks from the spirit. Nose: Alcohol jelly. Lime. Salted caramel and apple. Water brings out more caramel, a touch of milky coffee. More water adds floral notes. Body: Alcohol touched. Salted toffee. Moderate oak. Salted caramel. Water adds apples and makes smoother. Much more salted caramel. More water adds more apples and pears. Light cinnamon. Creamy notes and some lemon curd. Finish: Charred oak. Apples. Alcohol. Toffee malt drinks. Drying. Water adds salted toffee. More water adds lemon curd and light milky coffee. Conclusion: Ok, this has a lot of water room to it. Like a proper serious amount. Not entirely unexpected at best part of 60% abv, but what does stand out is that it is actually pretty approachable even when neat; Which means that you have more room for quality water play as you don’t have to add a ton just to get it to where you can taste it. No innuendo on water play please. That is my job. Neat to middling amounts of water it is very unlike any Arran I have encountered. Very toffee and caramel driven. Salted interpretation of both no less. Neat it is a little alcohol thick but still very drinkable, if a tad burning. Even a little water though turns it into a very smooth, kind of salted toffee doughnut style whisky. I was kind of addicted to salted toffee doughnuts for a while, I know of what I speak. More water, like heavily more water, adds a mix of traditional green fruit that feels like a more Arran by way of Hakushu whisky style. Initially just soft notes around the toffee, enough water means that the green fruit takes centre stage with the salted caramel around the edges. 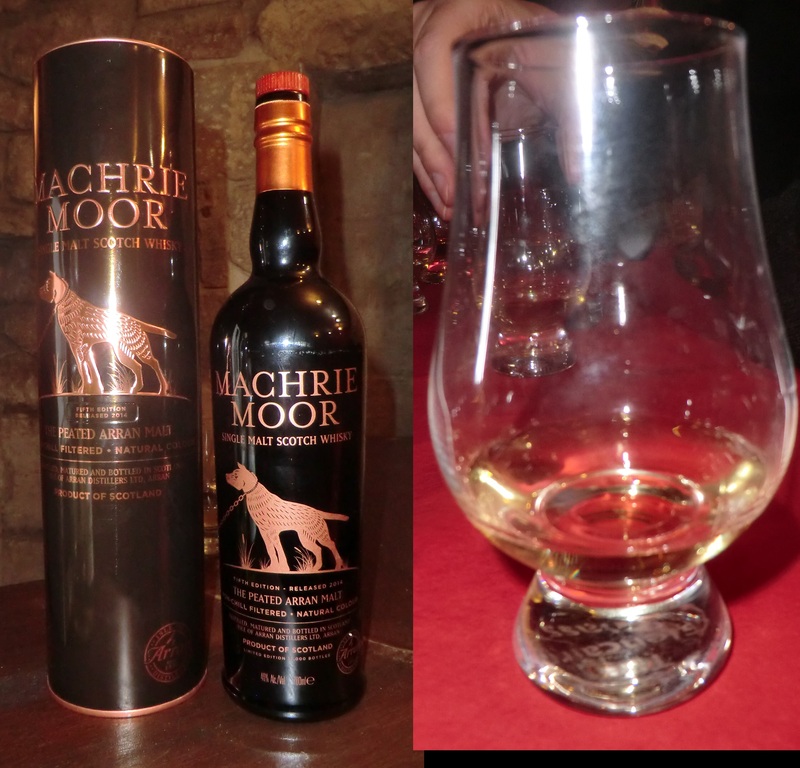 Initially as a salted caramel heavy whisky I found it soothing, smooth and easy drinking but not too complex. I was going to call it a whisky that did one thing but very well – a whisky for the high end of enjoying to sooth and relax with rather than examine. Water turned that on its head; lots of fresh green fruit, a good mix of character. It is still easy to drink but now more freshening than soothing, and with a touch of that creamy Arran character. Very enjoyable either way, and with lots of room to explore. Both defies Arran expectations and confirms them depending on how you take it. A very high quality whisky. Background: Second of Independent Spirit‘s independent bottlings of whisky. This time an Arran bottling – one of 57 bottles, distilled in 1997 and aged for 17 years in a sherry puncheon. Bottled non chill filtered at cask strength this definitely caught my eye. The label may look identical to the last, Fettercairn bottling – but if you look closely the cape colour has changed. Huge difference. Drink while listening to a general mix of metal – around the thrash to death side of things. Visual: Pale custard touched gold. Body: Very smooth. Orange crème. Vanilla custard. Alcohol builds up quickly. Fudge. Water makes even smoother and removes alcohol fire. Lime. Golden syrup. Tropical fruit hints. Slight beefy middle. Mild spinach greenery. Apples. Chocolate limes sweets. Finish: Fudge. Slight spinach. Vanilla. Light lime. Oak. Alcohol air. Water brings out malt chocolate, more sweet lime. Beef and onion crisps. Apples. Conclusion: This manages to both pack a punch, and be smooth as heck. Good combo. The big punch is easy to see – big abv, big flavours. It pushes a lot of straight forward fudge and vanilla custard sweet notes to sugar shock sweet levels. The smoothness is less expected – even at cask strength it hits smooth – though the alcohol fire does build up if held. Overall, good first impressions. Tobermory is an interesting distillery with both the Ledaig heavily peated expression, and the smoother, fruitier unpeated expression. This definitely sits towards the unpeated expression, but does not entirely escape the island character. I am not sure if the malt is peated at all, but there does seem to be a light whiff of peat smoke and a beefy middle – more than that is a greenery element subtly hidden within it. It feels halfway between spinach and seaweed, but since it is is so light it is not off-putting. All light elements but give a nice island backing to what would otherwise be a fairly standard sweet whisky. Apart from that? Well there is the more traditional Tobermory green fruit – here showing as apple and lime notes over the big sweetness. At the cask strength they are not really noticeable, but are soon evident with water. Overall, it blends the three sets of notes (Island, sweetness and fruity) to an impressive balance and with water it is pretty easy to drink. While the years have not brought exception complexity to this, they have brought clarity of character and a very luxurious feeling. So, yeah, good times here. Background: Yeah, this is a Tobermory independent bottling bottling, guess they were not allowed to use the distillery name. This bottle, with about a double measure of whisky left in it, was given to me by the kind fellows at Independent Spirit for me to do tasting notes on. Many thanks :-). As always I will still attempt to be unbiased in my notes. Drunk while listening to David Bowie: Black Star again. I am seriously never getting bored of the album. So damn haunting and beautiful. Visual: Nigh clear with a mix of green hints and vanilla toffee hue. Becomes hazy with water. Viscosity: Very thin slow puckering. Nose: Alcohol and crumpets. Rocks. Water adds heather and pepper. Body: Warm to burning. Buttered toast. Lemon pancakes. Water makes much sweeter – golden syrup and vanilla pods. Touch of vanilla yogurt with lime as well. Fudge. More buttery. Finish: Light lemon pancakes. Light oak. Butter. Water adds vanilla yogurt and toffee. Tins of tropical fruits. Conclusion: I don’t think I have seen a whisky with the nose and body so much at odds for a long time. The nose is, well, a tad rough. Not just in the alcohol, that element disperses with water so isn’t that big a deal. It is the fact that it has touches of crushed rocks and pepper that kind of sticks out – it is not that appealing. Though there are soft crumpet notes in there as well, but it doesn’t quite balance. So, how is the body? Well, neat it is mainly alcohol heat- so let’s skip straight to the part where I add the water shall we? Boom! Sweet golden syrup and vanilla pods – a real big sweetness over the kind of soft buttery base I associate with Arran, with a few lime high notes. Unfortunately adding even more water brings the body more in line with the aroma, not heavily, but it brings out a slightly gritty character to the base. It lowers the sweetness but keeps the butteryness, which unfortunately is less capable at holding up against the newfound grit. Still, if you keep the water on the lower end then it is a reasonable whisky that shows the strength of Arran well. Well, the body does anyway. Still, less is definitely more with water use here. Even at over 50% abv it turns far too quickly from where it works to where it is past the tipping point. It doesn’t really outdo the official bottlings i have tried – its main addition is the big sweetness with just a little water. Still, it does emphasise that buttery toast base, which is not something you see often. So, solid body, bit of a bad aroma. Not stand out but solid enough. Background: Ok, here we go “Ok, bias warning first: This is a part of the Masters Of Malt Whisky Calendar given to The Bath Whisky and Rum Club, part of Independent Spirit, who invited me to assist with the notes in return for uploading them to alcohol and aphorisms. Sounded a very fair deal to me. Also, due to this we each only had half of the 3cl bottle so thoughts are based on a smaller exploration than usual. On the other hand I could not say no to the chance to try so many new whiskies. Many thanks!”. Not run into ” That Boutique-y Whisky Company” though a quick googling shows that their bottles have some pretty non standard cartoon like labels. Not bad. Arran has been a nice smooth, if not always that complex, whisky for me, so I thought this may be nice. Drunk whilst listening to the haunting Ritualz CDR. Viscosity: Mix of slow and fast middling sized streaks. Nose: Smoke and peat. Dust. Honey glazed chicken. Tobacco. Chewy. Medicinal touch. Burnt beef. Body: Light caramel. Rising tar and alcohol. Solid peat. Honey and toffee. Cinder toffee. Apricot and cream when water has been added. Burnt sugar. Finish: Dry oak. Light sweet toffee and cinder toffee. Light apricot after water has been added. Conclusion: This is by far a less booming whisky than the aroma would have you imagine. The aroma promises a real medicinal, smoky whisky, but actually delivers a surprisingly restrained expression – so much so I can’t even call it a restrained beast, just, well restrained. I use the word “surprisingly” a lot in notes. I am easily surprised it seems. The body has a kind of cinder toffee effect, calling to a smoky fire cooked, bonfire night feel, but with a big sweetness to it. There is a kind of burnt sugar feel that is much more of a notable aspect than the smoke – all burnt brown sugar, cinder toffee and the like. It is interesting but far from what the aroma would have you expect. There are calls to the Arran house character with some soft apricot and cream notes, which gives a nice amount of complexity – however the peat doesn’t add enough to give it an edge over the more standard Arrans, and it covers up some of the style which makes those expression seem different. It is still an interesting mix, even if the split between aroma and body maxes it seem more a contrast than ever actually mixing. 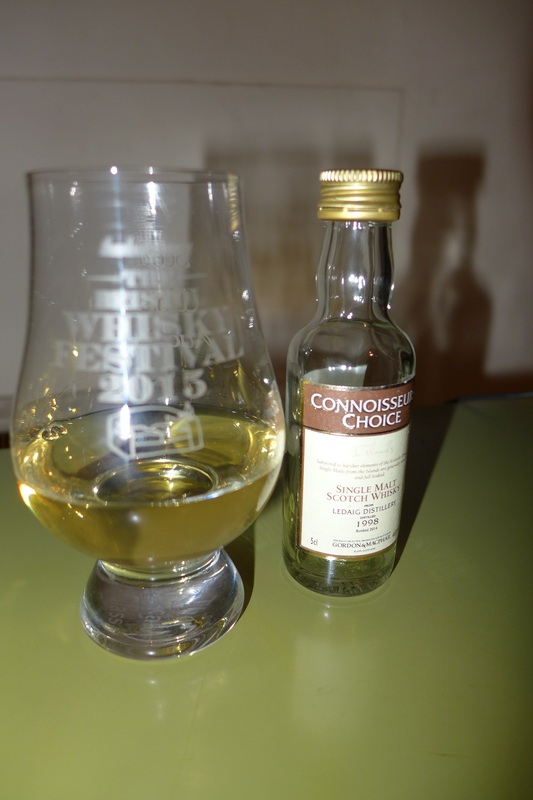 Nice, but not a favourite – could make a nice Halloween or Bonfire Night whisky though. Background: The final whisky of the (pre) Burns night whisky tasting at Independent Spirit. This is the (moderately) peated expression of the normally very creamy Arran malt. There is some tale attached to this, something about a dog, I have to admit by this point me ability to comprehend non whisky ideas may have been somewhat reduced. As before, this was a tutored group tasting so, despite my best efforts, I may have been influenced in my tasting notes.